3 social events in 3 months. Torrey Pines knows how to party! "A Valentine's Extravaganza" was the latest of social evenings for Torrey Pines members and guests, with dinner and dancing at the Mount La Jolla clubhouse on February 8. Music was provided by the California Cogs, a 6-person band of Rotarians from several local clubs. Special thanks to Penny and Gordon Shurtleff for organizing and hosting this event, including fabulous Valentine's decorations and table settings. An assortment of fine wines was coordinated by Bernard Streiff and the wine club members. Everyone was Scottish for a night at the club's Robert Burns birthday celebration on January 21. This traditional event featured clan tartans, readings of Burns poetry, whisky-tasting and a buffet dinner in which haggis figured prominently. Jeannette and Don Yeckel opened their gracious La Jolla home to the partiers for this event, which has been coordinated for the club over the past 5 years by Rotarians Ann-Shirley and Rob Goodell, our visiting "snowbirds" from Vancouver, Canada. And, it was a festive holiday evening when Torrey Pines Rotarians gathered for a pre-Christmas social and dinner on December 14 at the Crab Catcher Restaurant in La Jolla. 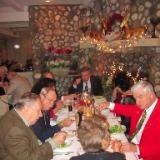 Typical of club social events, members, spouses and friends enjoyed the fellowship for which the club is known, along with wine and an excellent dinner. The several Chevaliers du Vin were splendid in their cups and ribbons. The good news is that the club is planning further social events throughout the year, so get ready to party--again.